A post note on Love, pure and simple. I received a email from a follower who lives in Canada and who had a question about the blog post I did with OPI’s color “Muir Muir”. Great question as I didn’t state it in my blog. The color that I used was a lacquer not a gel color. Thank you Gayle G from Canada! I can’t tell you how much I love this color. I don’t know if its because it is so rich in color, or if it is because it changes with different lighting. Or if it goes with everything a gal could wear! “Muir Muir on the Wall” from OPI’s San Francisco Fall Collection has it all. 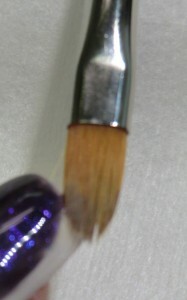 A deep plum-ish brown with an iridescent quality. When I first put it on, my hand was on a white towel and it really show cased the deep plum color. Then I put my hand down on my pant leg (so I wouldn’t be a nail nerd! and scratch them) and it took on another color! How can you beat that? It’s like getting more than one color per bottle. Hey OPI, you can use that for a tag line if you want!!!! This could be the perfect fall color. Great for work as it is in dark enough to be a neutral. Notice how it looks black on my thumb!!! It changes when the light changes. Metamorphic almost! Easy to wear for the week end with fun colored jeans or while gardening. Looks amazingly good with a Louis V too! Yup, for me, this is Love, pure and simple! Two coats with a top coat by the way. Have a great weekend. Some thoughts from those brilliant folks across the pond! What do you think? Do you have a favorite shape, color, or special effect? Thea Green, Founder of Nails inc London has this to say…. THIS SEASON IS ALL ABOUT GLITTER AND SPECIAL EFFECTS AND A SQUOVAL SHAPE WORKS PERFECTLY. While my friends are here from Canada, we were checking out the stores at Bellagio. Look what we found the Gucci!!!! Quick Change with a twist! 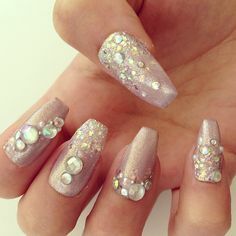 I have friends coming into town from Canada, and I know that there will be no time to do my nails. So I had to do a quick change, but I didn’t want it to be just a color change! Here is my fun twist on changing colors quickly! The white trend right now is really fun. I like it, but I am also in love love love with the dark romantic colors available too. I have a gel color from a older OPI collection called OPI Ink. 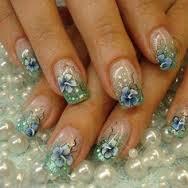 And I thought I would add a little twist to what I already had on my nails. I had a white base (Lacqit “It’s a White Out) with a glittery second coat (OPI-“Lights of Emerald City”) that I lightly buffed down. 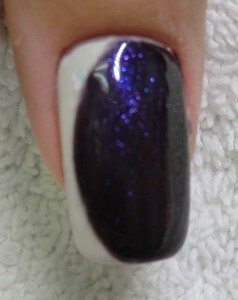 Then I applied OPI’s base coat for Gel Color and cured for 30 seconds. Next was the fun bit. I applied “OPI Ink” to most of the nail but then took a moist synthetic gel brush to detail the dark color to where I wanted it to end. After I cured that for 30 seconds, I repeated the process for the second coat. 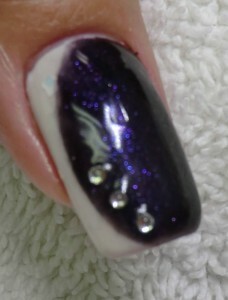 Once I had that coat cured, and while the surface was still sticky with residue, I placed 3 rhinestone into the purple gel. A light coat of OPI Gel Color top coat, 30 more seconds and voila, I had a quick change with a twist for when my Canadian friends are here! Now we can play and I can still rock some fun nails. With both of the colors I love right now! Jenny Longworth, Revlon UK Nail Ambassador has this to say about this falls newest nail shape trend!